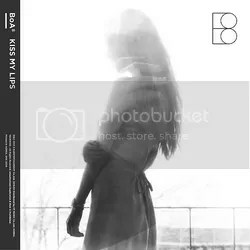 Kiss My Lips is the eighth Korean album by South Korean singer BoA, released on May 12, 2015. The song ‘Who Are You’ was released one week in advance. Kiss My Lips is the opening track, but also the title track and lead track. In other words, very important haha. It has a nice groovy beat with some guitar riffs in the background, but there’s also something very danceable about it. Amazing creation, and BoA’s vocals are clearer than ever, especially on those high notes. Good start of the album. Ofcourse we all know Who Are You (Feat. Gaeko) now, at least most of us do. Now that I heard this song more often and got a little used to Gaeko’s performance I think everything forms an amazing whole with a great vibe. It sounds great right after Kiss My Lips since there’s the same kind of grooviness in the music, yet the piano melody in the background makes it stand out a little more. I really like this song! With its pulsing beats and disco flavoured background that fits the theme of the previous two songs very well, Smash is a very enjoyable track. Even though it’s a little short at only two and a half minutes long, it’s a very catchy tune that tends to stick very well. Great vocals too. Then it’s time for a different sound. I always love it when artists do that on their albums. Shattered takes its inspiration from electropop and 80s pop, something I haven’t heard BoA do many times before but she definitely slays everything. The synths, the ethereal echo effects, the perfect overall production, everything about this song is good if you ask me. A recommended one! Fox is one of the few songs I haven’t heard a little preview of, but I instantly like its light and airy pop sound. I really like the guitar music throughout the song and the way they handled the overall music production. This is the type of song that tends to get predictable after a while, but it doesn’t happen here at all. This is catchy, cheerful and just very enjoyable. Is it strange that somehow the vibe of Double Jack (Feat. Eddy Kim) reminds me a little of Bruno Mars’ ‘Treasure’? It’s like a toned down version of it with a more mellow R&B sound to it, with also a little funk and post-disco. BoA’s and Eddy’s vocals mix very well together and I find myself moving along to the track while typing this, it’s so good! With Home, the album slows down to something more intimate. Everything in the music is all about a lone keyboard and a soft beat in the background, while the real focus is on BoA’s lovely vocals. She handles this type of song very well and even though it’s all very stripped down, it’s still very interesting to listen to. In BoA’s entire discography, I don’t think I’ll find music as interesting and original as in Clockwork. Now this is ART with capital letters, people. The use of strings reminds me a little of tango music, very creative and it makes the song a little more mysterious (and definitely memorable). Everything about this song just feels and sounds so right, I think this is the track I’m most enthousiastic about up until now! Love and Hate is a bit like Home, very intimate but even more emotional in the sound. Sung to just an acoustic guitar, this song is kept very minimal to put the focus on BoA’s beautiful and heartfelt vocals and she succeeds so well in keeping the composure of the entire song. Most of the time tracks like these are very tricky, but BoA manages. Good to find this here and not as the closing track as well (sometimes songs like this are put at the very end of an album, you know). Bringing back the disco sound of some of the previous tracks, Green Light also means the return of the upbeat tracks. When I heard the sample of this song released by SM Town last week I almost instantly fell in love with the sound, and now that I hear the full song I think that feeling is justified. It’s not surprising in its overall production, but very satisfying nonetheless. Hello is the next and last ballad on the album, but also very different from the other two. First of all it starts off very intimate but it develops into a more powerful concept further along. The arrangement is much grander with the piano, guitar, crashing cymbals and layered vocals, living up to all the expectations in the end. Loved BoA’s vocal techniques here. Closing the album, there is Blah. Not a slow song, but not all over the place either. It has a very positive sound and I like her lyrics ‘I’m in the middle of a controversy / Who’s talking about me? / I don’t care‘, reminds me a little of Taylor Swift lyrics to be honest (that’s a compliment). Again a very memorable song, I like it very much. I already thought this album was going to be good, but THIS good a quality just completely blows me away. If this isn’t the most perfect way to celebrate your 15th anniversary and your Korean comeback, BoA, I don’t know what is. There’s variation, great production value, nothing sounds rushed, BoA herself sounds more angelic and talented than ever… I think this is everyting I ever wanted as a BoA fan, this is definitely one of her biggest masterpieces and I’m not lying. Make sure you all get a hold of this album, guys! Too bad you feel that way! The albums you named were good, true, but like you said yourself: we all have our own opinions and I appreciate you giving yours here! 🙂 My own personal opinion is that this is a very good album, that’s why I have it 5 stars. I found myself literally dancing along to all the songs, so that definitely says something. Thanks for commenting! I personally LOVED the album from A-Z and I honestly think this is her best overall Korean Album. The fact that she actually wrote & prduced this whole thing is nothing short of AMAZING. Thanks K! You’re right, it is amazing that she wrote and produced the whole album herself, maybe it deserved some bonus points because of that ;P Great favorites too, I agree!